Of course it’s important to “be in the moment” when you’re on vacation — experiences aren’t real experiences when you’re fussing about something and not seeing and hearing what’s around you. However, no vacations are 100 percent unforgettable; some details are sure to slip through your memory’s cracks. Make sure to think about these camera options while you’re packing for your Niagara vacation to make sure you come home with all the memories you made during your stay. Niagara Falls is wet. 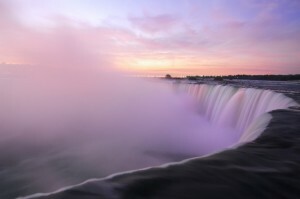 So much of Niagara Falls’ activities take place in or around the falls, which means you and your belongings are likely to feel some of the spray of the rushing water. If you have extremely delicate or costly photography equipment, you might forgo bringing it along while you ride the Maid of the Mist or Journey Behind the Falls. You don’t want to irreparably damage your priceless equipment — not to mention jeopardize participating in other Niagara photo-ops — because some water seeped in to the intricate tech. Instead, look into waterproof camera options. Plenty of companies sell inexpensive disposable waterproof cameras that can even go fully underwater without experiencing damage. Alternatively, you might find waterproof covers for your equipment if you really want the best pictures you can get; rain hoods are useful, but you might need something more extensive just to be safe. No matter what, to preserve your experiences of the falls’ relentless onslaught, you’ll need something that won’t be damaged by the elements. The grand vistas around the falls barely fit into your field of vision when you’re there, so capturing them with a camera is truly a feat. This is where your different lenses will help you out. Wide angle lenses allow you to include more of the scenery in your picture, but come in a variety of sizes. If you like quirkier photos, you might bring along a fish-eye lens to get an interesting perspective of the falls and surrounding areas. Moreover, the curve of the lens might allow you a wider view of certain landscapes. Niagara Falls is all about lighting. From the breathtaking pastels of sunrise, to the eye-catching, bright explosions of fireworks, there are plenty of opportunities for the light-lover to snap dazzling photographs. If you’re still using film cameras, you might look into purchasing a variety of films for the various lighting situations. The color temperature of the film will affect how your subjects appear in different lights, and slower films might be better for night photography. One of the more fun lighting tricks you can perform with cameras is a long exposure. If you bring along your tripod, you can leave the shutter open to get pictures of the falls over a long period of time. These photographs almost capture the actual movement of the rushing water. 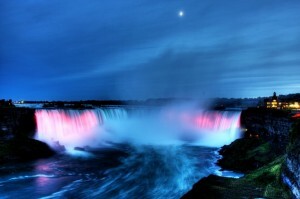 Plus, if you use your tripod and long exposure at night, the colors of the falls and the lights of the surrounding city will look even brighter.